Quantum Energy Squares are a new energy bar containing as much protein as a whole egg and as much caffeine as a cup of coffee. I’m a huge fan of all things caffeinated and was eager to give these a try. As most people are now aware, many bars in the “energy” and “health” categories come packed with added sugar, dyes, and fillers. Quantum Energy Squares are gluten free, vegan, soy free, dairy free, non-gmo, and contain no artificial flavors or colors. There are currently only two flavors of Quantum Energy Squares, and I’ll be covering both in this review. As the Quantum Energy Squares name implies, these are in fact squares and not bars. At 1.76oz (50g), they’re light weight and the packaging helps them store and pack down well. Weight is not something I really care about on day hikes, as I eat everything I’m carrying. For longer backpacking trips, weight can be more important as I’ll be carrying multiple items for an extended period of time. These bars provide a nice weight to nutrients ratio, and remove the need to carry an additional midday caffeine pick-me-up. The caffeine content is what caught my eye when I first read about Quantum Energy Squares. I usually carry a caffeinated gel or canned cold brew on my hikes, as caffeine helps me sustain my energy levels on longer outings. I also carry a few energy bar snacks. My hope was that Quantum Squares could kill two birds with one stone. My only hesitation was that I’ve tried solid food as a caffeine delivery system in the past with mixed results. I’ve eaten Quantum Squares on hikes over the past few months and can verify that they provide at least a cup of coffee worth of caffeine boost. I also had my wife try a few bars, and she felt the same. 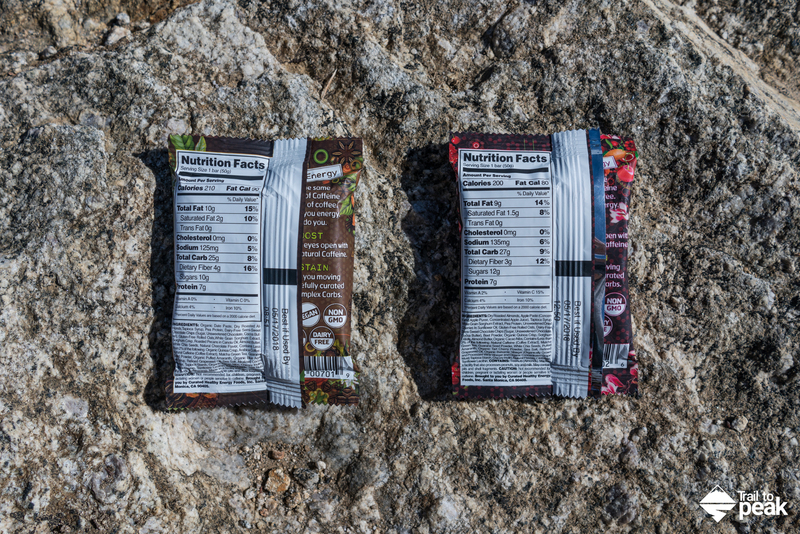 The food component of the squares has provided a great source of fuel while hiking without causing any GI distress. At the moment, Quantum Energy Squares only has two flavors, Dark Chocolate Cherry and Caffe Mocca Macchiato. The caffeine is provided by a mix of guarana seeds, matcha, and arabica coffee beans. You can see a full list of ingredients by enlarging the photo below. Texture is paramount for me when deciding on energy bars for hiking. I’ve had certain bars taste great at home and go down easy, but turn to chalk and clay when hiking with a slightly dry mouth. Taste is also important. Anyone that has completed a thru-hike knows how quickly certain bars can require maximum will and fortitude to injest after you’ve had too many. I wasn’t able to eat a Clif bar for a year after hiking the John Muir Trail! The Quantum Squares pass the taste test with ease. Both the Dark Chocolate Cherry and Caffe Mocca Macchiato use a blend of fruits, chocolate, and nuts for a well rounded flavor palette. The squares can be a tad dry on a dehydrated mouth and require consumption with water on long hikes and hotter days. This is par for the course for most of the dry food bars I test. For a quick pre-hike food option while hydrated, these squares went down easy. Quantum Squares is a small company based out of Santa Monica, CA. 1% of Quantum’s sales go towards charities, and they are currently working to support ‘Heal The Bay‘. You can read more about Quantum Squares on their website, and follow along on Facebook and Instagram. Quantum Energy Squares are not yet available through major retailers, but can be purchased on Amazon and through the Quantum Squares website. A pack of 9 squares is currently $24.00 directly from Quantum Squares ($2.67 per square), or $27.00 through Amazon ($3.00 per square). This is around the going rate for a non-junk energy bar in today’s market, and a competitive price for these quality squares. Disclosure: Quantum Energy Squares provided me these bars at no cost for this review. All product links provided in this post are affiliate links. Purchases made using these affiliate links go to support the content created here at Trail to Peak at no additional cost to you. Thank you for your support!